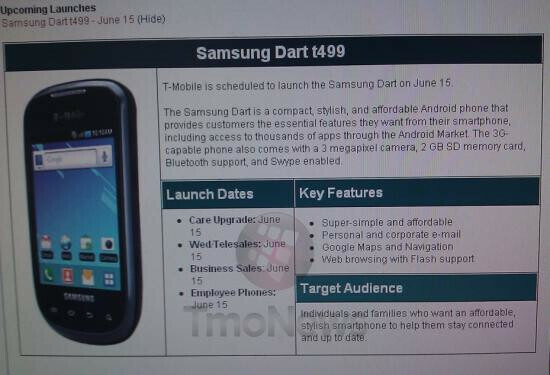 A leaked screen shot of an internal T-Mobile document reveals that the carrier plans on launching the mid-range Samsung Dart on June 15th. For those who don't need or want all of the bells and whistles available on high-end releases, the handset offers a 3MP camera, a 2GB microSD card and comes with Swype pre-installed. And because the document says that the Samsung Dart offers Flash in the browser, we can reasonably assume that Android 2.2 is aboard. While we do know the launch date, Samsung did not mention pricing in the internal document. 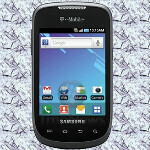 As we reported, T-Mobile also plans on launching the high-end HTC Sensation 4G on the same day which will allow the carrier to also target those looking for a handset with all of the 'latest and greatest' that Android has to offer. With the latter device priced at $199.99 with a new 2-year contract, we could see the Samsung Dart get tagged with a price of $99.99 to as high as $129.99 with a signed pact. Sounds like the perfect family scenario-Mom and Pop grab the Sensation 4G while Junior walks out with the Dart. Considering that the latter will launch next Wednesday, we should receive some official pricing information soon.